The skin on my face is extremely oily, rough, aged, scarred and pot marked. Most soaps are generally too gentle for my epidermis. The deep pours on my face are difficult to keep clean and free from blackheads. This Shaman Scrub Soap works for me because of its rough and gritty characteristics juxtaposition against its soft and easy nature. Shaman Scrub Soap contains some interesting ingredients such as Ylang Ylang and Eucalyptus oils with Pumice from the Navajo Mountains. The combination creates a medicinal rejuvenating experience when my face is scrubbed vigorously with the bar leaving my skin exfoliated and feeling incredibly clean and fresh. Shaman Scrub is two bars of soap in one. If you slip and slide it between your palms rapidly a soft light foam appears and can be applied to the skin gently without feeling the pumice. Then if you want to rough it up, just use the whole soap bar against your body or face and you will experience the full effect of the Navajo Mountain pumice. I’m curious how the soap is capable of having this duel personality. Rough and gritty as well as soft and easy. Passive/Aggressive! Then with the addition of Ylang Ylang and Eucalyptus Oils it seems to add a mystical and natural experience to its use. 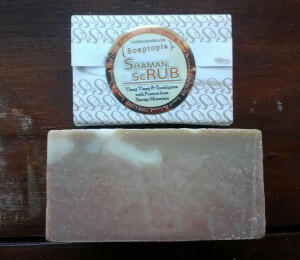 Shaman Scrub Soap has a spicy aromatic scent with an earthy back tone. At the same time it’s also intensely sweet and soft. There is a creamy rich top note aroma present but the overall essence is medicinal in nature. Lets try and break this soap down and see what “Shaman Scrub Soap with Ylang Ylang , Eucalyptus and Navajo Mountain Pumice” is all about. What is a Shaman? I would say a Mystical Medicine Man. One that practices Shamanism. Shamanism: Reaching altered states of consciousness in order to interact with the spirit world. Channeling transcendental benevolent and healing energies from the spirit world into this world. What is Ylang Ylang? The Ylang Ylang is a tropical tree that bears delicate flowers. The blossoms are shades of yellow, mauve or pink. The yellow flowers produce the best oils. Ylang Ylang means: ” flower of flowers”. The essential oils are extracted from the flowers for the use in this soap. Effects of Ylang Ylang Oil: Aphrodisiac. A calm breathing, lower blood pressure, help with anxiety, strengthen the heart, helps circulation, helps with impotency, helps with bronchial infections and asthma. Works as an antiseptic and an antibacterial. Helps many skin conditions. Has the ability to normalize skin secretions and minimize the appearance of acne scares. Acts as an antidepressant and calms nerves. Dispels negative emotions such as shock, fear, anger and frustration. What is Eucalyptus? It’s a tree as well as a bush that grows in tropical and temperate climates. It produces an oil extract from its leaves that is used medically and cosmetically. The oil is removed by steam distillation. The health benefits of the eucalyptus oil are well known and wide-ranging. Some uses of Eucalyptus: Acne control, deodorant, anti-inflammatory, decongestant, antispasmodic, joint pain reliever, mouth wash, may even help control blood sugar. So what is Navajo Mountain Pumice? It is a near white volcanic glass mined as a natural ore in New Mexico and transported to the San Juan Pueblo for processing. After crushing and grinding the ore into pure fine grain pumice it is then ready to be used in cosmetics. When you research all the benefits of the oil extracts from ylang ylang and eucalyptus, combined with the positive effects of Navajo Mountain Pumice, I’m sure you will make this soap part of your cleansing arsenal. So shower soon with the “Shaman” and don’t forget to Scrub A-Dub-Dub. Soaptopia Shaman Scrub with Ylang Ylang, Eucalyptus and Navajo Mountain Pumice. This is a must try soap. Get it at Soaptopia.com.